Today was our designated Anne of Green Gables day, and I want to start this post by addressing the judgy people out there who would accuse us of falling into the tourist trap while here on PEI. For Ashley and I, we knew there was potential for cheesiness, we knew it could be horribly tacky, and we knew we couldn’t leave the island without seeing the Anne-related sights. 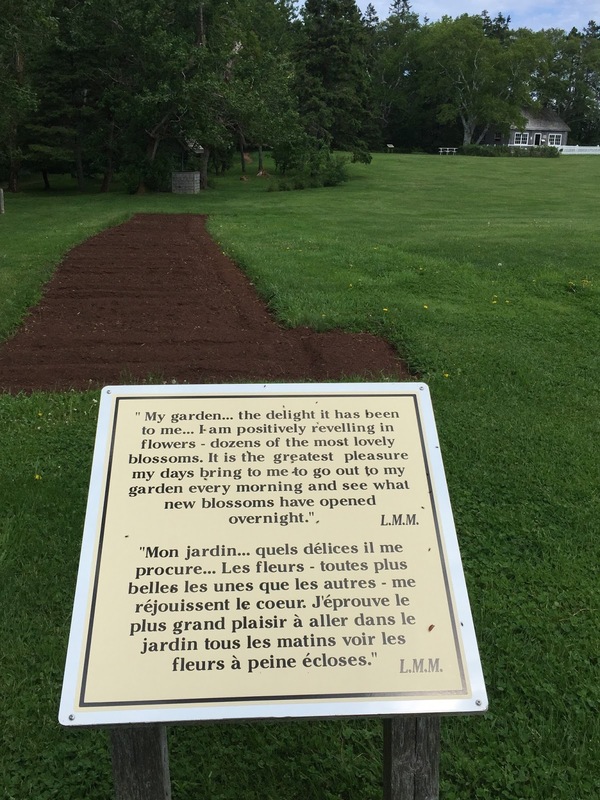 With that said, I have to tell you, both of us were quite touched and very impressed at how well done the Anne of Green Gables and Lucy Maud Montgomery (LMM) heritage places are arranged. They are legit historic locations that are considered an important part of island history (with the exception of Avonlea Village which is a waste of time). Our first stop today was the Green Gables Heritage Place which was a site owned by LMM’s grandparent’s cousins. She played there as a girl, and then based the setting for the Anne stories on the Green Gables house. The Anne of Green Gables stories were so special to me when I was growing up, and even more so when I moved to Tennessee and realized that Anne is a woman who is trying to get back home to the place that she loves. I sob every time I watch the films because I think of Long Island and the North Fork and how much I wish I could move back there, how my heart is forever captured by the shoreline. Turns out, LMM got married and moved to Ontario, and for the rest of her life she wanted to return to Cavendish and the place where she grew up. She was quoted as saying that she had done a “violence to her soul” by leaving that place, and she identified it as home up until her death when she was brought back and laid to rest in the Cavendish cemetery. 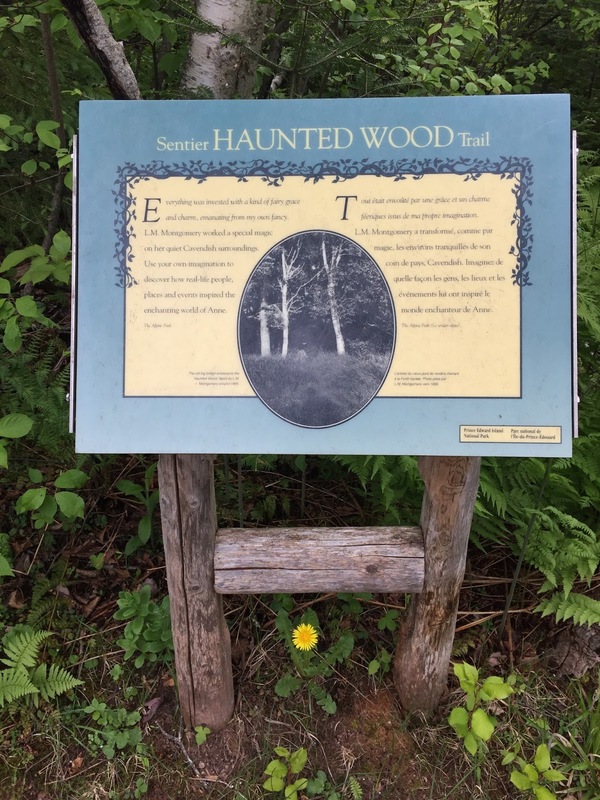 We walked through the Haunted Wood (yes, that Haunted Wood that is talked about in the books) and saw the original site of LMM’s Cavendish Home. Walking through the fields and seeing scenery that made my heart want to burst made us realize what an incredible job LMM had done in portraying PEI in her stories. Why yes, of course we could see Anne and Diana running across the fields to each others house! 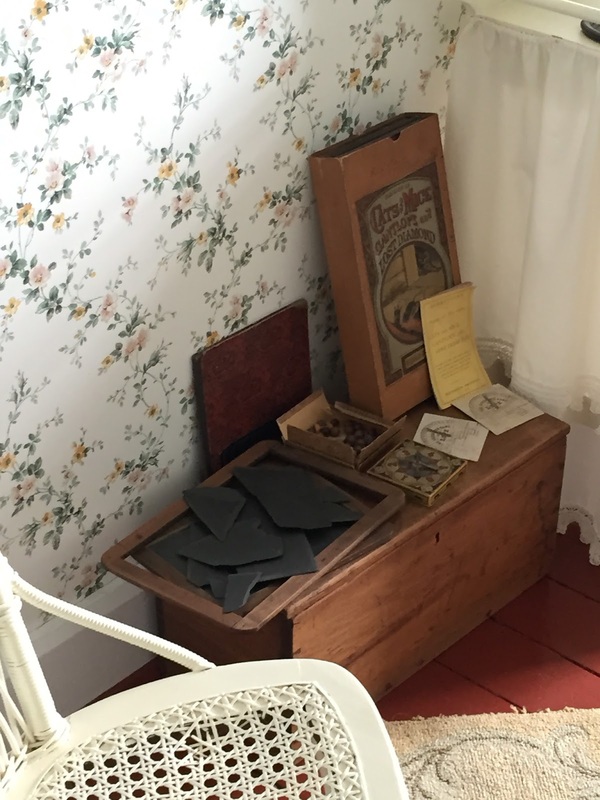 After we left the Green Gables house, we headed over to LMM’s Birthplace, another historical site that has been lovingly preserved by the people of PEI. 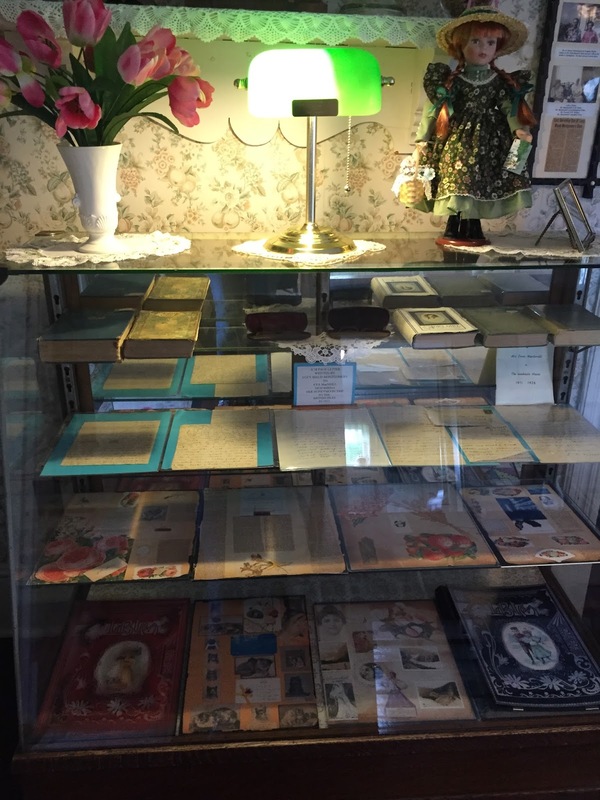 The rooms are full of her letters, pages from her scrapbooks, and even her wedding dress and honeymoon shoes. It’s all so personal and really gave us a sense of who she was. It also makes you realize how the movies truly tried to capture what life on PEI was like. In fact, we saw some old pictures of the island from that time and it actually looks almost exactly like it does now. This place is so well preserved and pristine, that it’s not hard to imagine LMM growing up in these exact surroundings. We then headed on another exploratory drive just for the heck of it and ended up finding an adorable tea shop where we had raspberry cordial, scones, and rhubarb pie! 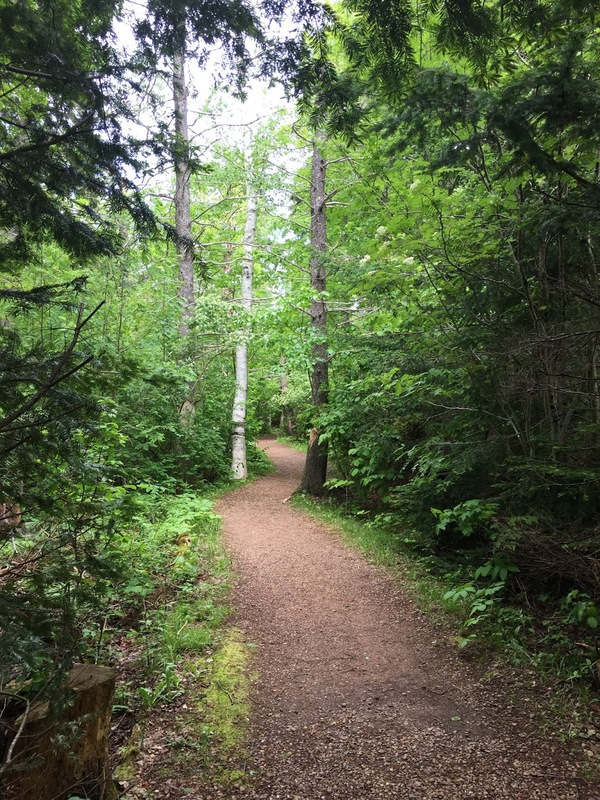 We continued down Route 6 toward North Rustico Harbor and entered a different part of PEI National Park where the coastline is carved with jagged red cliffs. At one point we spotted some foxes frolicking in the distance. When we hopped back in the car, we ended up seeing another on the road. We stopped and he started circling the car to check us out! His coat was gorgeous and I was immediately thankful for parks like this that protect these beautiful creatures. It felt like we were in Narnia and he was coming by for a chat! On to North Rustico Harbor, the cutest little town on the face of the planet. As we drove down the road I thought my heart would explode. Everything about this place is adorably perfect and lovely and idyllic and every other cute thing. We parked the car and took a stroll down the boardwalk which borders the harbor, where we ran into a local gentleman who had been a lobster fisherman for 54 years. He grew up in North Rustico and it sounded like he hadn’t left much in his lifetime, yet his admiration for the place was evident in the way he spoke so lovingly about it. That’s the thing here, these houses on the water aren’t summer homes. They belong to people who live here year round, most of whom grew up here, and they love it to pieces and say things like, “It’s the best place in the world” and it’s so touching to see and makes you feel like you’re getting a peek into a magical little fantasy. I am in love. The past couple of months have been stressful at home and at work with projects and changes, yet a couple of days on this island has refreshed my soul. It’s like the stress has fallen away and my shoulders aren’t tight anymore. The air here is so clean and salty, always blowing off the sea. The scenery is almost too much to take in and my heart feels so full.